Borgo Villa Castelletti has its origins in the 17th century when it was used as a farmhouse. It was recently renovated in a mix between a hotel de charme and the quaint Tuscany villa, achieving one of the finest three stars hotel in Florence area. The city can be reached in 15 minutes by train and in a few minutes you will be able to go for wine tours and wine tasting in the Chianti. Tuscany is the ideal setting for relaxing working holidays or with the family, to enjoy a romantic getaway or for your activity holidays. This country boutique hotel with a pool, is also a golf resort thanks to its partnership with the nearby Pavoniere Golf Club. 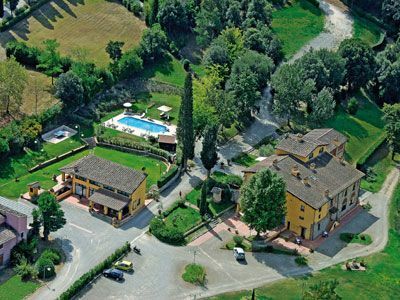 Il Borgo offers cooking school for culinary holidays and a yoga school for meditation and yoga retreats. Horse riding is also possible in the wonderful park. At Villa Castelletti you can find your vacation rental and villa rent for longer stays or enjoy a bed & breakfast in Florence for short breaks, with a difference from the classic business hotel. The Ralais is situated in a hill area, immersed in the green park with ancient trees and a lake. Nearby you can find the Wellness centre Hidron 5 km, the Golf Club Le Pavoniere 18 holes 6 km, tennis court 3 km. Not far from the relais you can also find shops, restaurants, supermarket. Signa, 3.5 km from the relais.